Did you know that 9th and 10th graders don’t all know what it’s like to try to force two magnets together that don’t want to be close? Or haven’t felt the pull between magnets that want to be together? OR thought about how magnets (with charged poles) interact with uncharged (i.e., neutral) things? Every year this surprises me. Growing up in a home in which my mom was always extending my learning and doing the same with my daughter, I forget that not all children have these opportunities. How am I supposed to build student understanding about interactions between invisible particles when they haven’t investigated interactions they can actually see? While I was at the aquarium with my daughter looking through the gift shop, I had an epiphany when I came across metallic rocks. This would be a cheap way for my students to interact with charged substances! 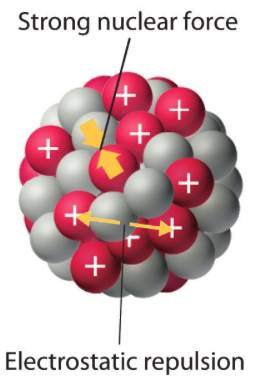 They could then build connections between the rocks and atomic nuclei, hopefully resulting in real learning about the forces within the nucleus. This begins the development of a couple science stations: one for atomic structure basic review, another for neutron-proton ratio practice, and two focused on nucleon interactions; we’ll focus on the last two. 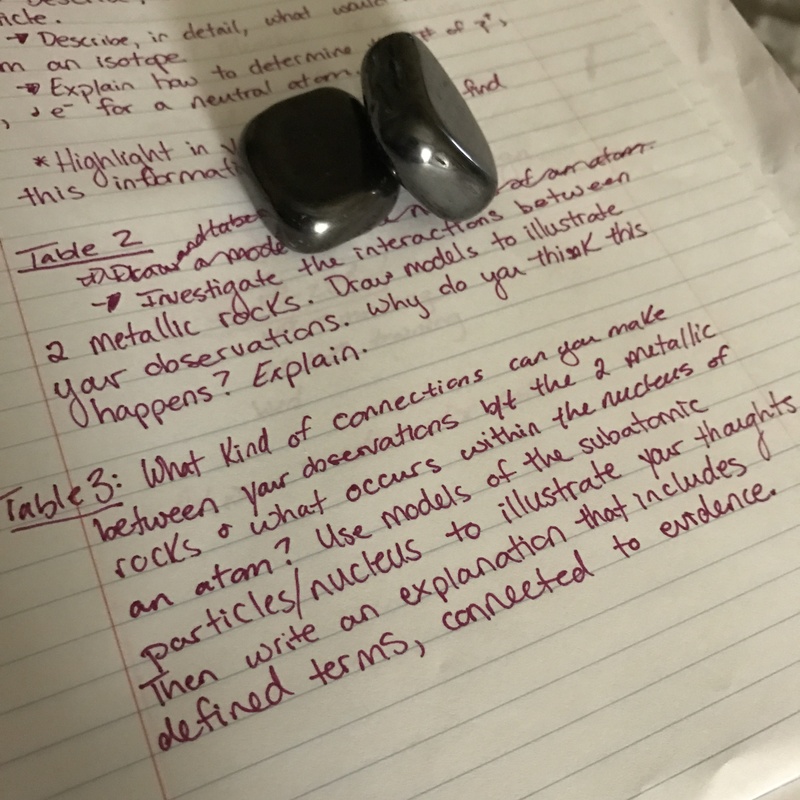 First students would interact with the metallic rocks by playing with them followed by drawing models to illustrate their observations and constructing explanations for the causes of those observations. The next station would have students make connections between the metallic rock interactions and what happens within a nucleus. Below you’ll find an outline for what I did in class before, during, and after this activity (focused on interactions and not all nuclear stability). At the end I’ve provided my reflections and improvement plans for next year. 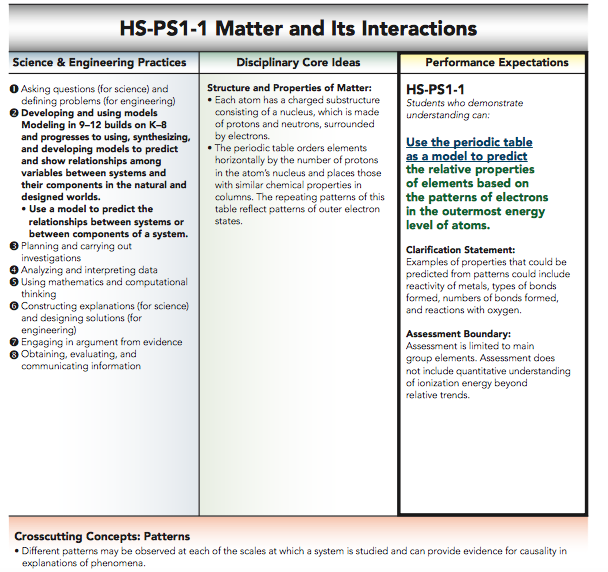 Standards Addressed: Lays the groundwork for HS-PS1-8 (nuclear processes), and addresses the first bullet for HS-PS1-1 (each atom has a charged substructure…). Science Ideas Behind Phenomenon: Charged particles interacting with each other either repel or attract. This force is known as either a repulsive or attractive electrostatic force (energy that occurs between charged substances). There is a repulsive electrostatic force inside the nucleus due to the positively charged protons being so close together. This can cause nuclear decay if the neutrons are not able to decrease the repulsion by being between the protons, and assisting the strong nuclear force in holding the nucleus together. Crosscutting Concepts Used: Patterns – like charges always repel, opposite charges attract. Science and Engineering Practices Used: Carrying out an investigation, constructing explanations, using evidence to support claims, and developing/using models. First my classes watched The Island of Stability video by OETA and NOVA. This video is a great 13 minute clip that introduces students to the importance of nuclear stability and making/discovering elements. I particularly love the animation portion for the subatomic particles and forces found in the nucleus: a body builder for protons, a nerdy guy for neutrons, and a bungee cord for strong nuclear force. I like using this vide o as an introduction to nuclear chemistry (at this point in the semester we have already discussed atomic structure so students have a basic understanding of this concept). 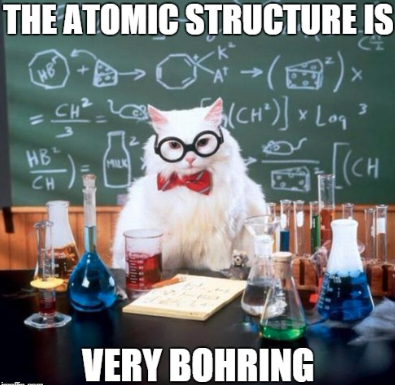 After the video and a short discussion, I hope students understand that nuclear stability is dependent on how neutrons and protons are arranged in the nucleus. Students will carry out an investigation to gather evidence on particle behavior by observing the interactions between two metallic rocks. Students can draw models to illustrate their observations and begin constructing explanations for the causes of those observations. Next I asked students to use their notes about nuclear structure (we’ve been over subatomic particles and their charges, forces within the nucleus) and our conversations over the “Island of Stability” video, to connect their observations between the metallic rocks and what was happening between subatomic particles in the nucleus. Seems like a simple task right? Well not so much lol Students rrreeeeeeaaaaaallllllyyyyyy struggled with this. While they struggled I did not provide the right answers, just asked lots of probing questions, “What were your explanations for the metallic rocks?” “What types of things are found in an atom that might behave like those rocks?” “What part of the atom is our current focus?” I found that even though they had all the information at their finger tips several still wanted me to just tell them the answers, or they waited for their partner/another group figured it out. 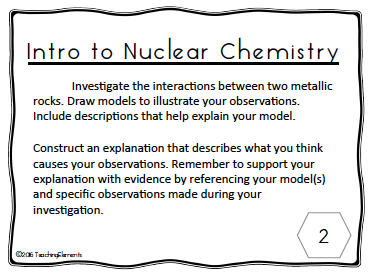 Any way, this step required students to write explanations for the causes of the interactions between subatomic particles in the nucleus that included models and evidence to support their claims. I involved the whole class in reviewing their answers from the previous two steps by asking groups to share out and/or elaborate (if they could) on the previous groups answers. During our discussions I would ask about “science-y” terms if they used them; for example, students would say the magnets had poles, so my response was for them to explain what it means to be polar or “have poles.” Students are learning that in my class science vocab is not allowed unless they can fully explain what that term means (no hiding behind big words!). 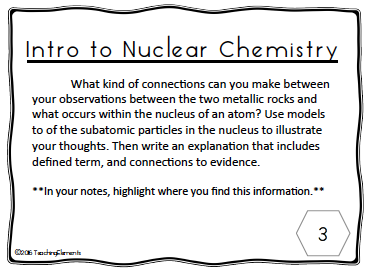 While we discussed both scenarios (rocks and nuclei) I wrote notes on the board, asked students to make connections with what they wrote down, and to add or delete info as needed. Everyone seemed to understand but then…..
Summative assessment time! I asked students to write down on a separate sheet of paper their responses for how the metallic rock interactions were similar to what happens in the nucleus of an atom. I asked them to include their models, and terms (with explanations). This is where I learned a big lesson which will be discussed in the reflections below. Still love the NOVA video and will continue to use it. Next time I think I’ll do some sort of share-out/communication between groups right after the interactions with the metallic rocks. That way we sort through some student misconceptions before they begin applying that information to something else. While students struggled through using information, and lab evidence to construct ideas about interactions within a nucleus I’m going to do this the exact same way. I want students to build those bridges and me do it for them. What I will change though is…. Next time I’m going to incorporate regular rocks as well. Students struggled with explaining how protons interacted with neutrons. I think incorporating these will help them construct their explanations. Overall I thought this was a great investigation! I look forward to the adjustments for next year, and I plan on referencing this investigation as we begin to move into electron configurations along with periodic trends for atomic radii, ionization energies, and electronegativities. I’m hoping that since we’ve used the term “electrostatic force” that when it’s brought up again all of my students will have some prior knowledge to reference. What do you do for your students when learning about forces within an atom? I’m always looking for ideas, so please share! I don’t ever want my students thinking…..
Have a Voice – Get Involved!